Panoramic Jerry Cooke photo sends off "The King." 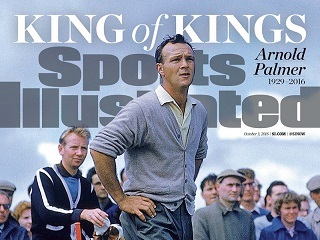 Imagine yourself today at the offices of Sports Illustrated, sorting through all the possible photos and illustrations to use for a U.S. national edition tribute cover to Arnold Palmer. In the end, as managing editor Chris Stone affirmed via Twitter, “there really was no other choice but this beauty from Jerry Cooke, shot for the magazine in 1960.” As the publication sometimes does when warranted, it has revealed its next cover a little earlier than usual. That’s caddie Tip Anderson in the background, on Palmer’s bag, watching as the golfer tried to win at St. Andrews that year the third leg of the sport’s modern Grand Slam. Cooke, who shot dozens of SI covers over the year, passed away in 2005.